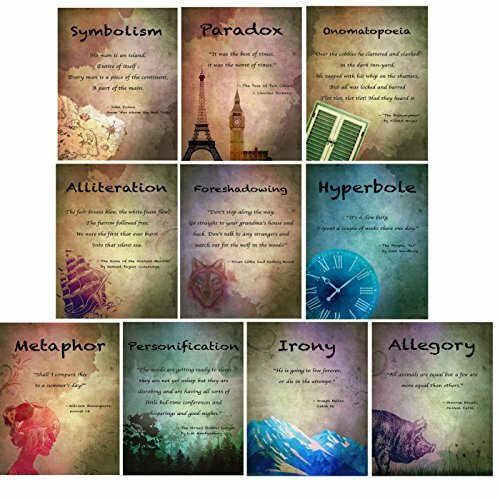 Vintage Elements of English Language and Literature Posters, Set of 10 (Onomatopoeia, Paradox, Personification, Irony, Allegory, Metaphor, Symbolism, Foreshadowing, Alliteration, and Hyperbole) by wallsthatspeak at HoldUp Art. MPN: SNYKTALiterature. Hurry! Limited time offer. Offer valid only while supplies last. For an extra pop of color on a wall or a revamp for your interior decor, this beautiful set of poster prints by WallsThatSpeak is a great way to go. For an extra pop of color on a wall or a revamp for your interior decor, this beautiful set of poster prints by WallsThatSpeak is a great way to go. These stunning wall art prints measure 11" x 14", making them ideal for any space, no matter how large or small. These vintage-style pieces are printed on high-quality paper stock with top-grade ink for a clean, crisp image. Each print is created only after an order has been placed. Because we don't mass print any of our wall art, we save a fortune on paper and ink, which allows us to provide our customers with quality products at a lower cost-all while being kind to the planet. Our gorgeous decorative prints feature old-fashioned images for an artsy feel. These prints are lightweight, making them easy to hang. Each print can fit easily into a frame to keep the image safe and secure from rips, wrinkles, and tears, or it can be displayed on its own. Their color scheme also allows them to fit in well with many design styles and any existing interior decor in your home, office, or classroom. These tastefully beautiful wall art prints from WallsThatSpeak are perfect for any room, from office spaces and waiting areas to your family room or bedrooms. Regardless of placement, these beautiful vintage-style prints from WallsThatSpeak are sure to bring not only a pop of color and stylish flair to your decor but a smile to your face as well. All of our products are printed and shipped from the United States, so all domestic orders arrive promptly with minimal shipping and processing time, making our wall prints a convenient and cost-effective addition to your home or workplace. This poster package includes ten prints which can be displayed as a set or individually, depending on your preferences and display capacity. With this beautiful WallsThatSpeak print set, you can bring a tasteful spark of beauty and inspiration to any room in your office or home. WALL POSTERS FOR VERSATILE PLACEMENT - These beautiful wall art pieces by WallsThatSpeak are great for use in both a work setting or in the home. This gorgeous educational wall art set is a great addition to your office or classroom space for elementary, middle, and high school. Each poster has a quote from a popular novel illustrating one of ten literary terms. CONVENIENT PACK OF TEN - These posters by WallsThatSpeak come in a convenient set of ten. With this package deal, you can easily display them anywhere, either as a set or individually. These posters are sturdy and are resistant to rips, tears, and wrinkles. This vintage-style print set is an excellent way to give a boost to your day, from students and employees to your own family. SIMPLE DESIGN - Each poster print in this WallsThatSpeak package has a tasteful, old-fashioned design and makes a great gift for teachers or English enthusiasts. These posters measure 11" x 14", making them perfect for display either on the wall, a table, or countertop. Printed on high-quality paper stock with top-grade ink, these posters fit easily in poster frames or stand alone beautifully. GREAT FOR ALL AGES - This convenient 10-pack of Vintage Literary Terms prints by WallsThatSpeak outlines various literary and English linguistic terms. These gorgeous prints are sure to delight men, women, boys, and girls of all ages. Whether you're using this set in your office, classroom, family room, or other location, these print posters are an excellent way to add some beauty to your day. PRINTED IN THE USA - WallsThatSpeak is based in the USA and prints each poster or print upon receiving the order. This helps to save paper, ink, and other materials while greatly reducing the chance of typos or design flaws. All domestic orders are shipped from the US and arrive promptly with no additional shipping cost, making these prints a beautiful and cost-effective way to decorate. If you have any questions about this product by wallsthatspeak, contact us by completing and submitting the form below. If you are looking for a specif part number, please include it with your message.